Layla Diamond, a rock and roll reporter in her late 30’s, decides it’s time to settle down. Following the advice of her daffy mother, she adopts what she thinks is her best option, a divorced man. She sets her sights on a charming sports agent with a needy ex and two obnoxious children. Frustrated, she tries setting up the needy wife with a new boyfriend, which backfires. 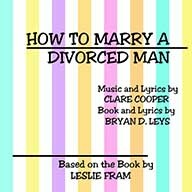 While trying to fix her Divorced Man’s problems, Layla makes one miscalculation after another, adopting false identities, causing multiple mix-ups, and turning her marital quest into a hilarious farce.